This past October 20th I walked into my Japanese go club, the Southbay Ki-in, located in the New Gardena Hotel, 1641 W. Redondo Beach Blvd., Gardena, CA, 90247; (310) 327-5757, about 1:30 pm and saw Michael Simon, who has been associated with the American Go Association (AGA) for many years, supervising the play of two Korean professional go players (members of the Hanguk Kiwon = Korean Go Association) against two members of our club. I was surprised at this, but recognized the professionals as having attended the recent Cotsen Open. This is a typical example of AGA stupidity and ineptness. Had our club been given some advance notice that the professionals would be coming, we would have rolled out the red carpet for them and ensured that the club was packed with members to play them. As it was, the professionals had little to do, playing barely more than a couple of games each. They cut their visit short and exited well before the club’s closing hour of 5:00 pm. Three club members, Tony Emsenhuber, Tim Chang and Kevin Carr had participated in the Cotsen Open, so we made a respectable showing there. But more members could have been drawn in to play if any effort whatsoever had been made to contact us. For my part, I have been put off by AGA actions long ago, and refuse to be a party to anything they do. It is their loss that they alienate so many go players like me. More on that later. I asked Kevin Carr to tell me about his experience at the Cotsen Open. "It was great! One of the best times I have ever had playing go. Eric Cotsen put on a fantastic tournament. "But unfortunately, the tournament started two hours late, and that threw off everyone’s timing. [Please remember: Eric Cotsen has been sponsoring this tournament under the auspices of the AGA for thirty years. One would assume after so many years of supervising this tournament, the AGA would know how to schedule things correctly.] The lunch truck was there all day long, and Eric Cotsen’s team was great in making sure of that, but players in the tournament had to juggle eating lunch with playing their games. It was hectic!" 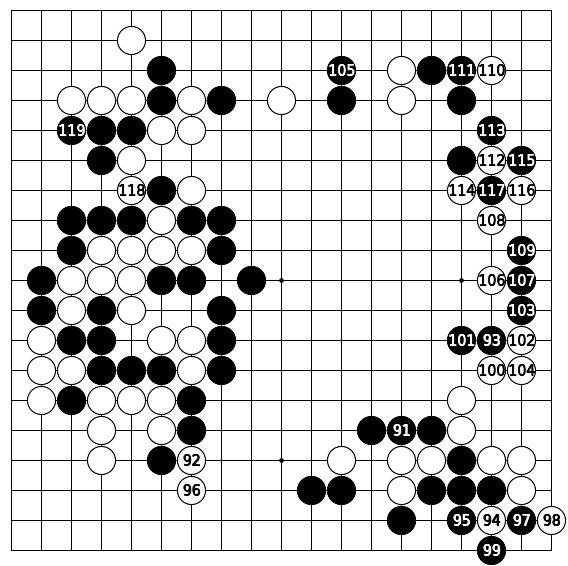 One of the highlights of the Cotsen Open is a game that Yang Yilun 7 dan plays against an opponent online in his homeland of China. I asked Kevin how that was. "There was some commentary given on a demonstration board," Kevin added, "but the participants in the tournament had to get back to their boards. I would have liked to hear more about that game, but…" Another example of AGA ineptness depriving the players they are supposed to be helping from getting the full appreciation of the range of opportunities to enjoy go that Eric Cotsen is so generous in providing. Besides Kevin’s thoughts about the Cotsen Open, I also asked him about the Korean professionals who visited our Japanese go club this past Saturday. Kevin continued: "I was playing my games with players in the club when the Korean professionals were there, but you know, what I would really have liked to see was the professionals playing several boards simultaneously with members of the club lined up to play them one after another." Yes, indeed. When I was Kevin’s strength that was a wonderful thrill for me. I still remember defeating Haruyama Isamu at 8 stones in the old Rafu Ki-in while he was playing several other boards. It is a memory that I cherish. The next year, 1978, I joined the AGA. 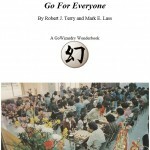 I contributed articles translated from Japanese, copies of "Go World" magazine and money to the organization. 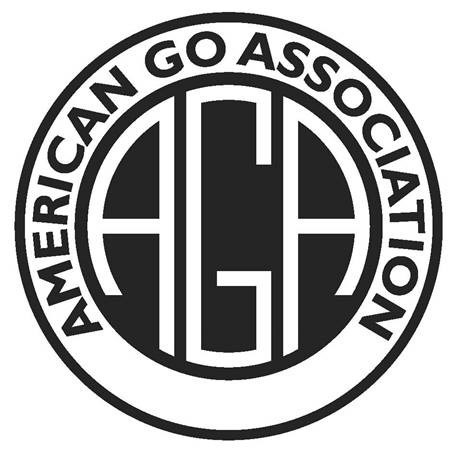 I also held two Western US Go Championships (the forerunner of the US Go Congress) for the AGA. I only stopped supporting the organization when it became clear that it was doing nothing to promote go. 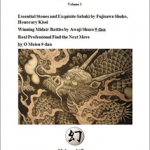 That is, after the AGA had been given millions of dollars from the Nihon Ki-in to promote go and failed to do so. Present case in point: had our club been given some advance notice by the AGA that Korean professional players would be coming, we would have arranged for a fine time to be had by all. As it was, no one was told and no one will ever give the matter a second thought. This will surely be the legacy of the AGA. A shame. After years of providing millions of dollars to the AGA for the promotion of go, the Nihon Ki-in has turned its back on that sad sack organization. The AGA has now found another dupe in the form of the Hanguk Kiwon. How long will it be before they wear out their welcome there as well? I will now continue my analysis of the 2018 Meijin title match. Incidentally, this game is now being presented in the Asahi Newspaper that sponsors the tournament. 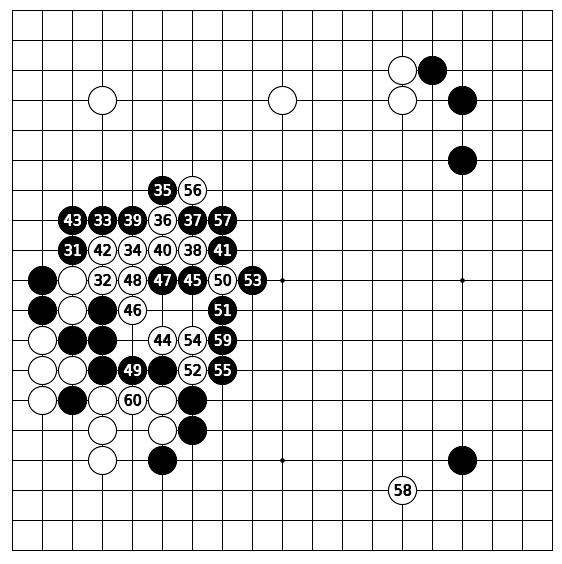 In the go column, a few moves are given each day with explanatory diagrams, too. I would like to read them, but I am still settling in after moving three weeks ago. So the chaotic conditions make that impossible. I suppose that I could get that commentary online, but I don’t know how to do that, either. Played on September 24 & 25, 2018. 278 moves. White wins by 4 1/2 points. When White attacks the upper right corner with 6, Black’s diagonal attachment at 7 followed by 9 is surprising since it gives White the ideal extension at 10. In connection with White’s star point stone in the upper left corner, this is ideal development. It must be stressed: this is a terrible way to play go. Do not imitate this! Why did Black play this way? 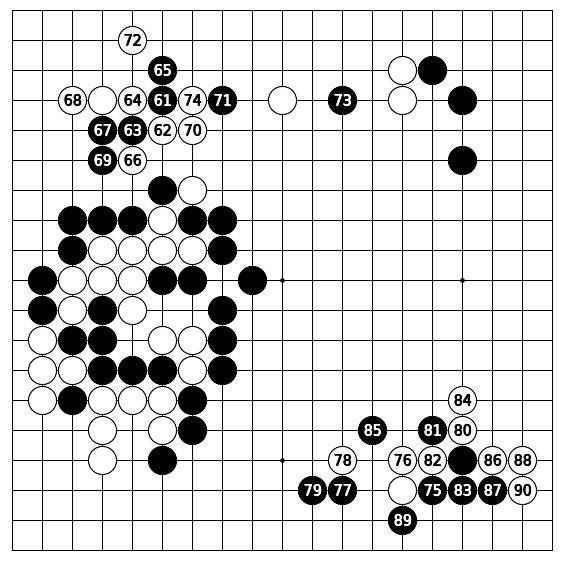 I don’t know, but I remember that back in 1972 Ishida Meijin-Honinbo made a double attachment in dealing with two of his opponent’s stones that had attacked his corner star point stone with a one space corner enclosure. That violated the go proverb: "Avoid the clumsy double attachment." Ishida went on to lose that game. It became a topic of controversy at the Nihon Ki-in. "I suppose that Ishida was trying to challenge conventional wisdom," was one comment. Was Iyama doing the same thing here? Or perhaps he just wanted to take sente to attack the lower left corner twice with Black 11, judging that the advantage gained by taking the initiative in the early fighting was worth the territorial loss. However, one other thing that strong go players know is that incurring a loss before envisioning recompense is dangerous. Black continues playing in a high-handed manner with the moves through 29 in this figure, but it is hard to see how this strategy can be successful. Black is spread too thin. Maybe having a 2-0 lead over his opponent led him to be reckless? With the move at 30, White takes solid territory. The game is now equal from that standpoint. 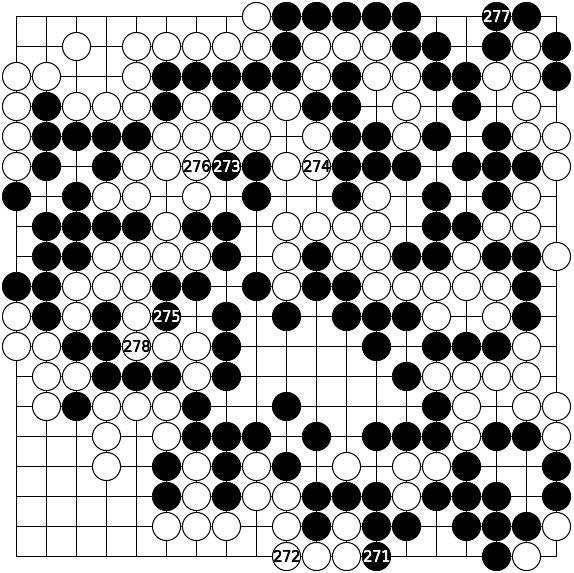 Unless Black can find a way to coordinate his stones to reverse the balance in the game, he is lost. In this figure, Black gives up territory to White in return for thickness. 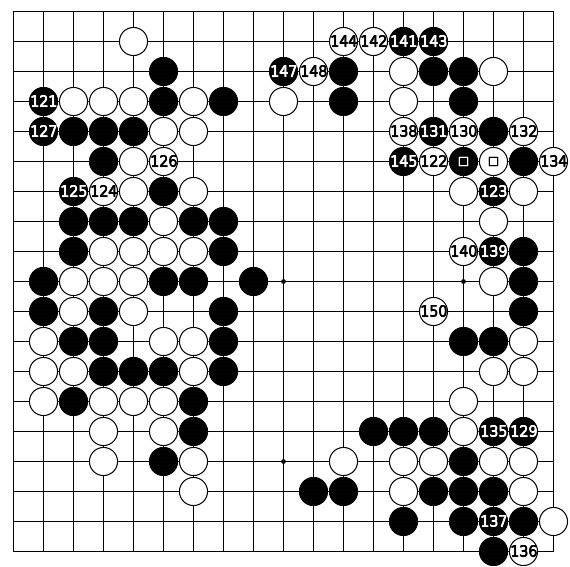 In particular, the one stone ponnuki capture of Black 53 in the center of the board is considered huge according to conventional wisdom. [Confer. the go proverb: A ponnuki is worth thirty points.] How is the balance of territory versus thickness to be judged in this case? First, White has captured six Black stones. That equals 12 points. So subtract that from the 30 points. That leaves 18 points. White also gets sente, which at this point in the game equals 10 points. So the total is 28 points, or almost the same as Black’s. But Black’s position has cutting points that can be exploited. Therefore, in truth, White has gotten the better of the bargain here. Attacking the corner with White 58 also aims at the cutting point below Black 55. "The best defense is an offense," is another piece of conventional wisdom, and here Black does that by attacking the upper left corner with 61. However, White meets Black move for move. The fact is that White has secured 30 points of real territory in the lower left corner. Now it seems that White will be able to take another 20 points in the upper left corner. That will give White 50 points in the game. Black has nothing to counter that except thickness in the center. But will this translate to 50 points? Unlikely. Consequently, Black ignores White 74 (which will most likely secure the needed 20 points) by expanding the scope of the fighting with the move at 75. 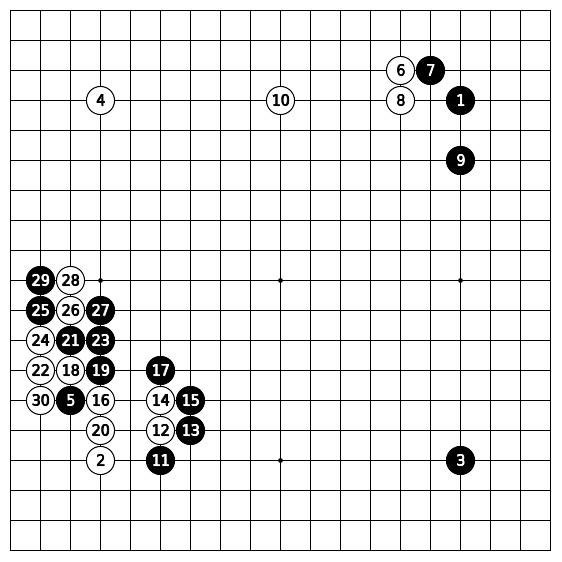 However, although this is again an attacking move, it violates another basic tenet of go: go proverb: "Do not attach against opponent’s stones one wishes to attack." Responding with 76 gives White the advantage in the game. At this point, all White has to do is to make sure that Black does not take any territory that is not compensated for. The position has been simplified to the point where that will not be difficult. The play in this figure shows White doing everything possible to guide the action into smooth channels where the game can be wrapped up. Black 91 not only practically captures Whites stones in the lower right corner, but makes the center thick and strong. However, all White needs to do in return is to cut at 92, expanding the territory in the lower left. Black has no answer for that. White follows that up with the descending move of 96. This is typically described in Japanese commentary as an "ironic move." White is saying, "The game is over, no matter what you do." That is the fact. White can just sit back and relax, sipping tea as Black writhes in agony. White has set up a ko on the right side of the board to demonstrate how little Black has control of the game, and starts the ko fight with the atari of 122. There is a feeling that White is just toying with Black. The game is over, and this is a meaningless ko fight. The board position here might appear complicated, but it is actually very simple. Black must exchange the four stones on the right side for White’s eight stones (including White 180) on the upper side. That is an equal trade. It does not affect the outcome either way. In this figure the game winds down. The result is known to both players and there is nothing to be done except to play things out to the last empty liberty. This is an instructive game for weaker students to study, because the strategies the players used are relatively straightforward and it is comparatively simple to count the board. Anyone wishing to become stronger is advised to do just that. One might wonder why the opponents keeping playing if they both know the result. 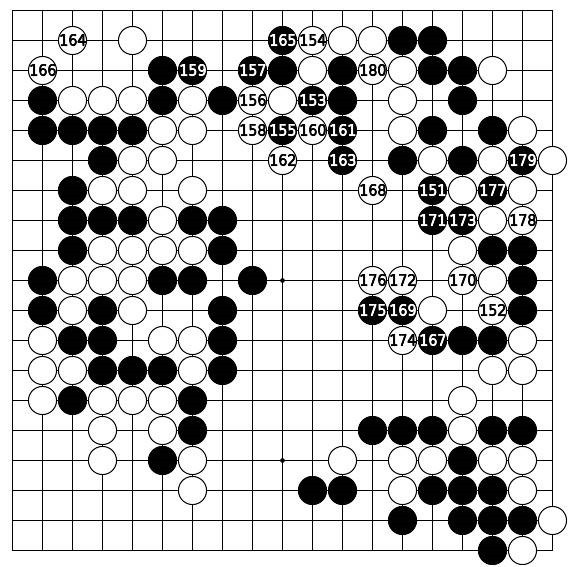 I don’t know, but at my Japanese go club this past Saturday the two opponents I played drew out the games to the end, although they both knew they had lost. 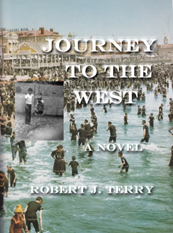 We even arranged the territories to count, when it was plainly obvious that I was far ahead. Then they resigned, without counting the board at all. One of them hung his head as if he was ashamed at losing. This is puzzling to me. I am a strong go player and everyone in the club knows that. Next Saturday we will have our quarterly banquet and the discussion at the table will revolve around the playing conditions. Some players want to have a handicap stone system for the next tournament, some want a komi system, some want a mixture of the two. I don’t care. I leave it to everyone else to decide. I will comply with whatever decision is made. It is puzzling to me that such trivial matters are even worried over. But I suppose that’s the nature of go clubs. Some players feel that one way or another gives them the advantage. I feel that analyzing games like the one here gives me insights that I can apply to my own games. I don’t need extraneous help. So how did the play end up? 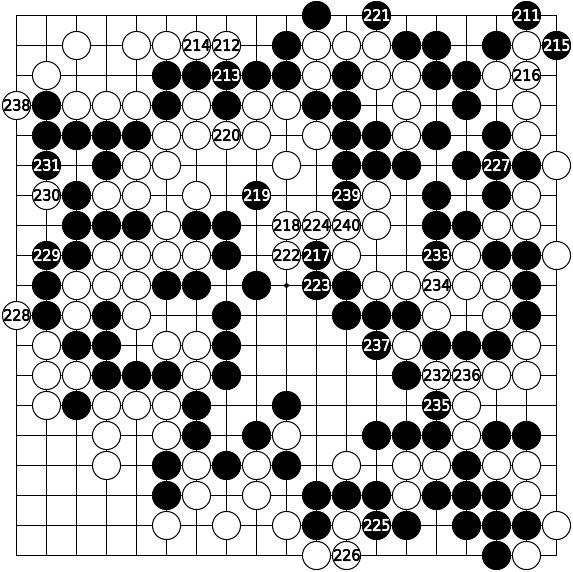 Black’s territory in the center, including the territory controlled by the ponnuki, is 30 points, just as predicted by the go proverb. 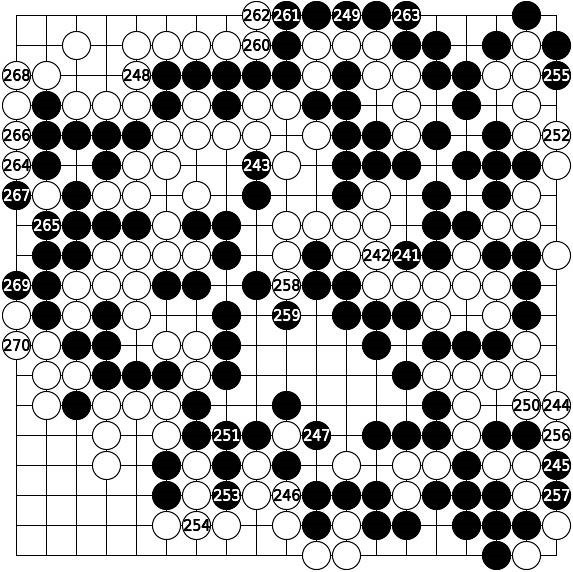 But White’s territory in the lower left corner, obtained in exchange of the ponnuki grew to 48 points. This shows that Black’s strategy was flawed.